Monday's ordinary thing takes me to a cafeteria thirty-some years ago. This was where Mother and I would rest after a long day of shopping at Frederick & Nelson. It was breathtaking to sit so high above the checkered linoleum on the metal-legged stool, listening to the clinking and tinkling of the cups, saucers and silverware in the kitchen. 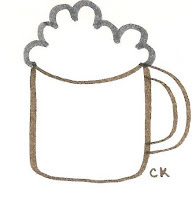 Ah, the thrill, when the lady in the brown ruffled apron set down my tall, white mug of hot cocoa, topped with its lacy mound of thick, cold whipped cream. The mug was heavy. The cocoa was hot. The day was now amazing. In your mind, is it cocoa or hot chocolate? Does it have marshmallows or a peppermint stick? Where is it served, and by whom?